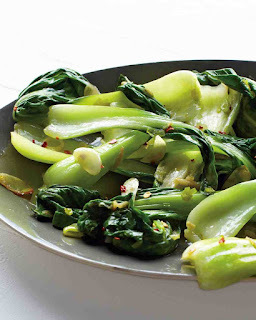 This recipe can be made with baby bok choy or regular bok choy sliced lengthwise into 1 1/2-inch pieces. It goes well with tofu, steamed fish, or meatloaf. Heat oil in a large skillet over medium-high heat. Cook jalapeno, garlic, and ginger for 1 minute. Add bok choy and water, and steam, tightly covered, until tender, 7 to 8 minutes. Uncover, and cook until any remaining liquid evaporates. Season with salt.